Already established as the premier running event series in and around Quebec City, Courir a Quebec (or Run Quebec for English speakers) recently underwent some organizational changes that should have a major impact on improving the already popular race series. We spoke to Marie-Michelle Gagné, head of media relations at Run Quebec about what’s in store for the coming year. Canadian Running: Tell us a bit about the Run Quebec City Race Series. What is it, who is it for, what do you offer? MG: We have made a few changes for 2017 and will now offer five exceptional events throughout the spring and summer. Our race series begins with the popular Oasis Half-Marathon of Levis on May 7 and later that month, we host an exciting trail race, Trail du Coureur des Bois. Another popular race is the speedy Descente Royale on June 4, and two weeks later (June 18th) is our totally unique Quebec City Staircase Challenge. Our final event of the series is our signature event, the SSQ Quebec City Marathon, which takes place over the August 25-27 weekend. We offer events for all ages and abilities and have totally revamped our pricing structure. Pay Your Age is one of the new features being rolled out for young runners, meaning that a seven-year-old would only pay $7 to enter any of the youth events. 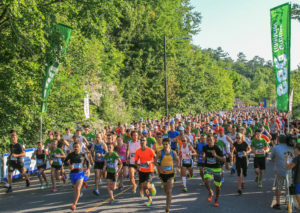 CR: What do you feel is unique about your events and about running in Quebec City? 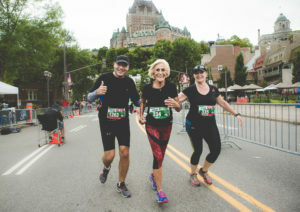 MG: We’re most proud of always putting forward unique and beautiful courses so participants can discover and appreciate the culture, history and natural scenery of Quebec City while running. The Quebec City Staircase Challenge is the only event of its kind in the world. In the 19K course, participants will take all the staircases that connect the Upper and the Lower town of Quebec City, alternately going up and down about 30 staircases for a total of more than 3,000 steps. There is also a more beginner-friendly 13K option. CR: The SSQ Quebec City Marathon is celebrating its 20th year in 2017? Any exciting surprises? MG: With the change in ownership–GESTEV now owns and operates the Run Quebec Series–we’re excited to offer many more novelties for 2017 in order to provide a full-on festival and celebration of running. In total, we expect over 10,000 participants in all events and have made changes to our branding including our website, race t-shirts and finisher’s medals. We are also introducing festive cheering zones on the courses as well as at the start/finish areas. Finally, we have partnered with many local merchants and restaurants to offer participant’s discounts and preferred access at and around the time of the events. CR: In addition to the races, what are your top recommendations, tips and advice for (visiting) runners to do in Quebec City? MG: If you are looking for a great place to run and train, we definitely suggest the Promenade Samuel-De Champlain, Bois-de-Coulonge Park, the Plains of Abraham and Station Duchesnay, which are mostly trails. Old Quebec City offers plenty of activities, restaurants and hotels (The Fairmont Le Château Frontenac) as well as tourist attractions. Quebec City’s rue du Petit Champlain has recently been crowned Canada’s prettiest street according to a national survey by the Canadian Institute of Planning so we definitely recommend making that a priority to see and experience. For other suggestions, visit this site.